Back in the early 1990′s (pre-WWW) I came up with a concept for an animated series called “Tuff Tacos!” (or possibly “Tough Tacos!”) which featured a gang of hard-shell tacos who dressed like cowboys but rode motorcycles. They got into some sort of adventures, probably in an Old West setting. There was also a soft-shell taco who rode a scooter. He was sort of the wimpy member of the gang. I never did anything with the concept, so here’s a crappy drawing I made today. 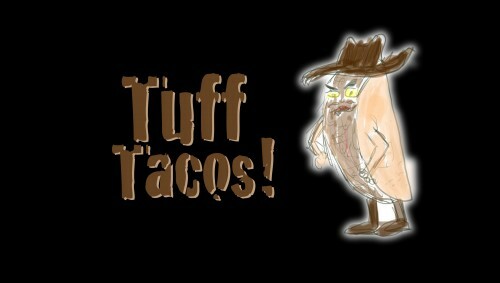 Also, there are other Tuff Tacos out there, arguably much better. Posted on Thursday, September 16th, 2010 at 1:47 pm. Subscribe to the comments feed. Both comments and pings are currently closed. Post on your own blog.